Start by measuring the circumference and height of the cafetiere. Mine is a standard, 8 cup model that measures 12.5″ around and about 6″ tall – just measure the height of the straight part of the glass. You’ll need a rectangle of felt that is about 0.5″ shorter in each direction (so 12″ x 5.5″ in my case) plus an extra piece for the fastening. 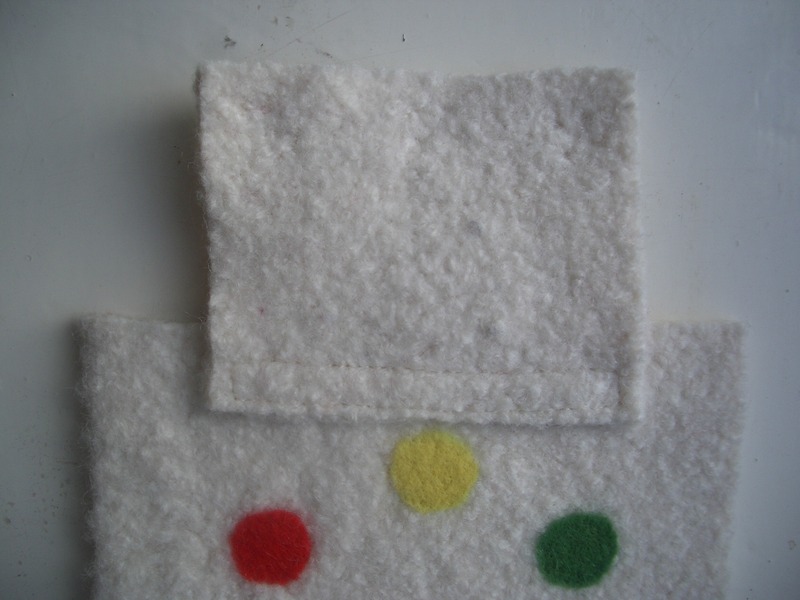 The felt needs to be a plain colour because you are going to embellish it. 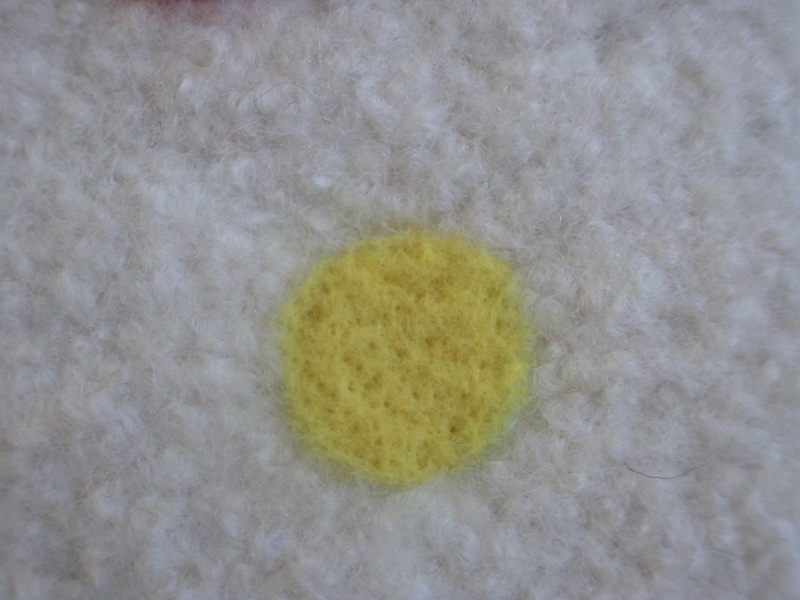 Either use a piece of thick industrial felt or else throw an old sweater (100% wool, not superwash treated) in the washing machine on a medium/hot wash to felt it up. You may need to wash it more than once before it is thick enough and there is no danger of it unravelling when cut. The piece below was the front of an old cardigan. 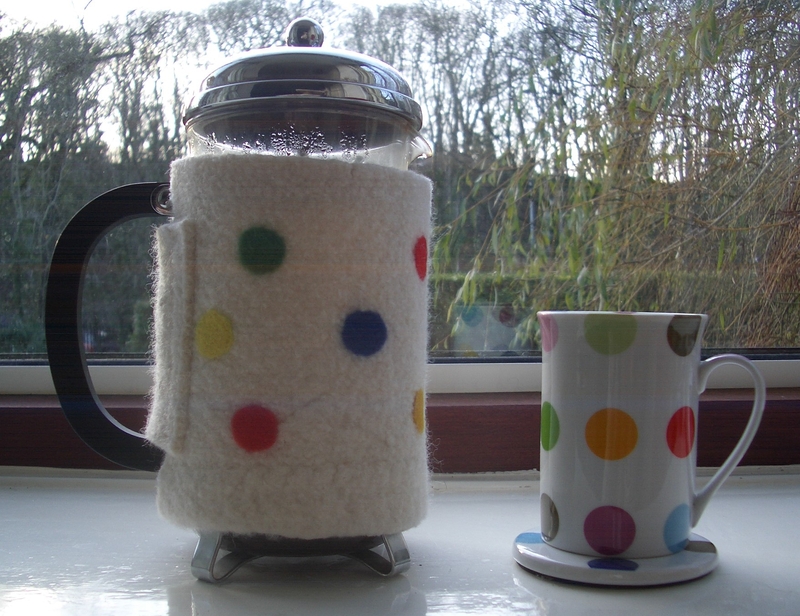 Cut a paper pattern of the size you think you need (mine was 11.5″ x 5″) and check it fits neatly around the cafetiere. The two ends won’t meet because the handle is in the way, but they should stop just short of the handle. 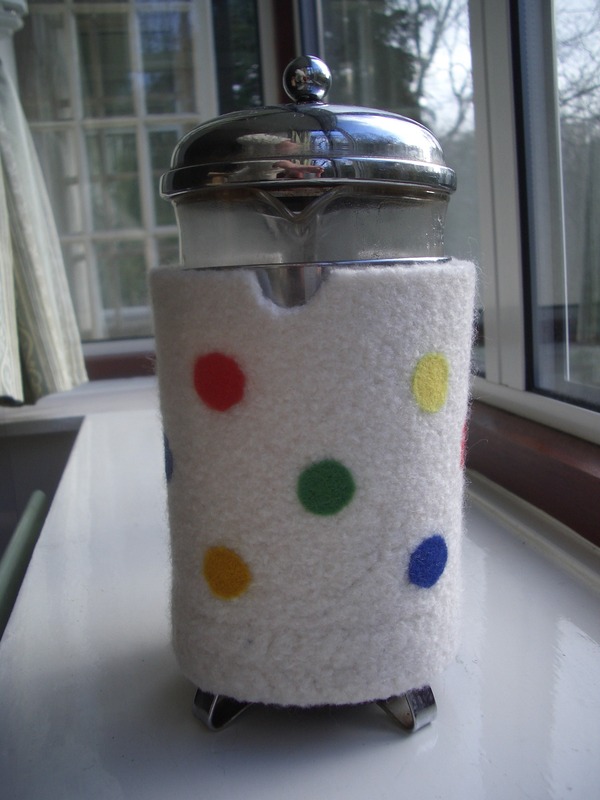 Cut out a little V where the cafetiere’s pouring lip is, to make it less likely that the felt muff will get drips of coffee on it. 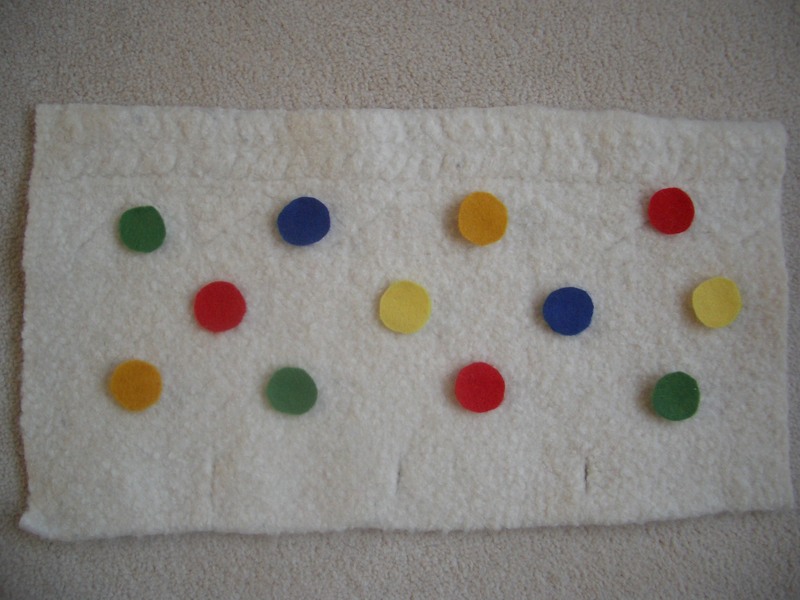 When you are satisfied that the pattern is the right size and shape, pin it to the felt and cut around it. 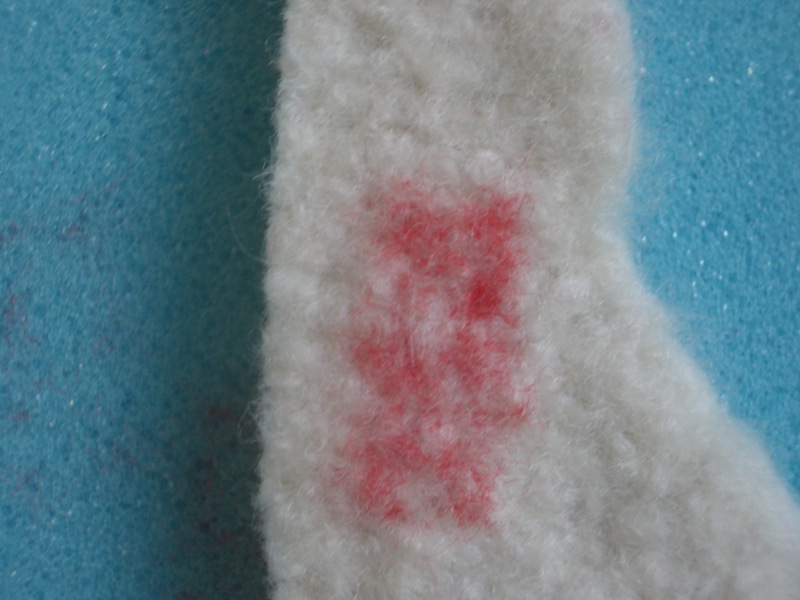 If this is your first go at needle felting, practise first with scraps of the backing felt and embellishment felt. 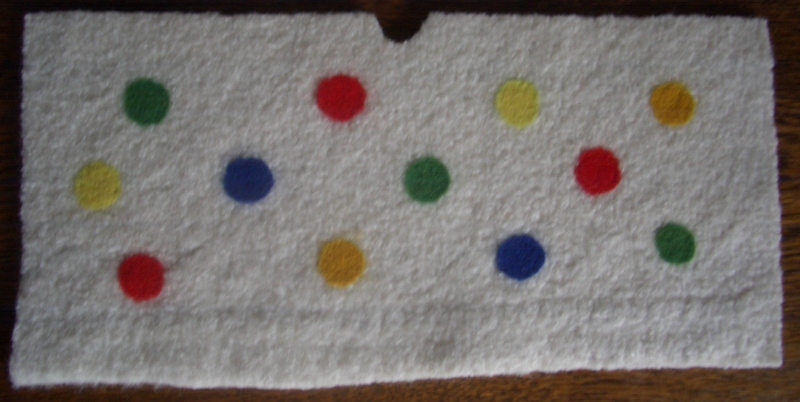 Place the backing felt on the foam block with the coloured felt on top, hold it in place with your finger (or a pin tip) and stab the felting needle repeatedly into it. 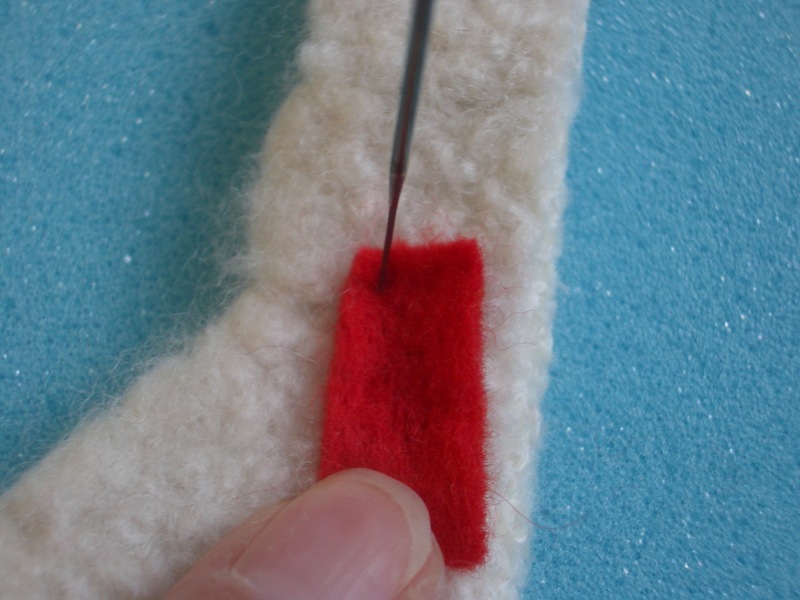 Hold the felting needle upright, perpendicular to the surface of the felt, or it will break. While any part of it is in contact with the felt, it must only move in an up and down direction. 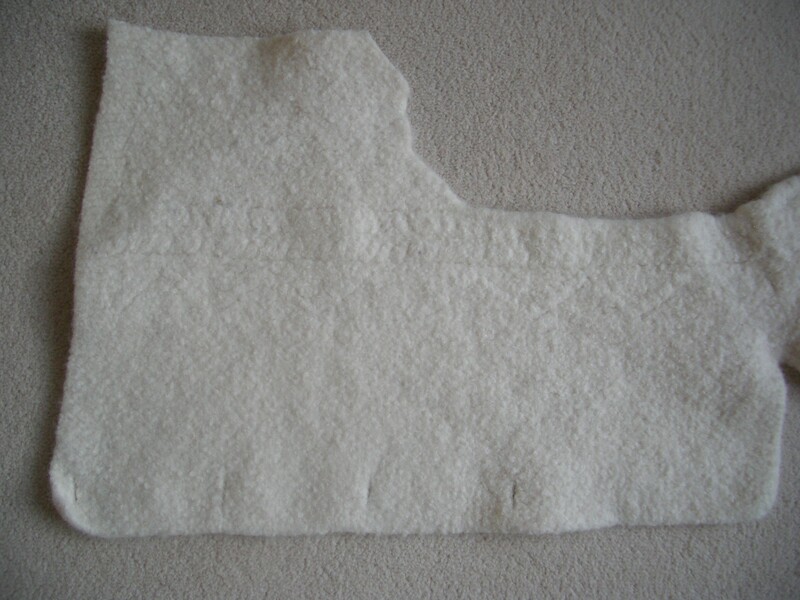 If you turn the backing felt over, you should see a coloured shape on the other side, indicating that fibres have been taken right through the fabric, like in the photo below. 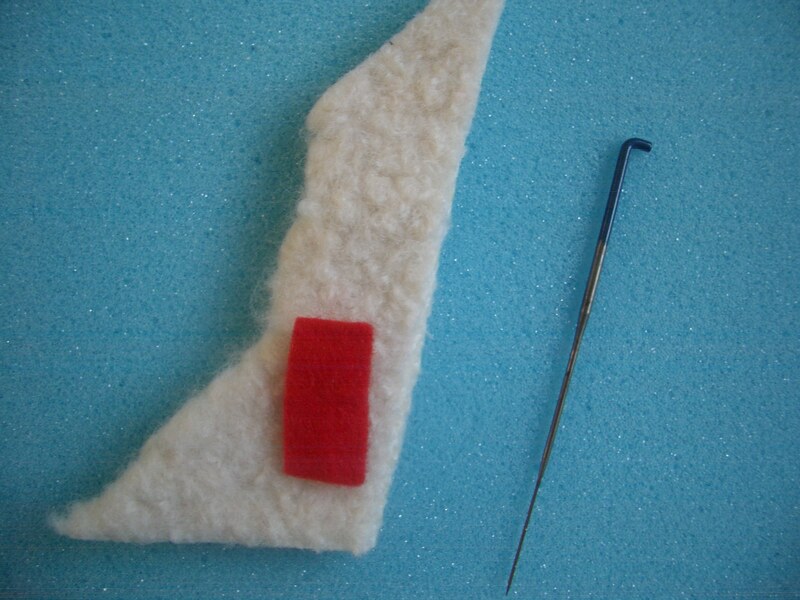 Next, you must go back over each appliqued shape and needle felt it more thoroughly. 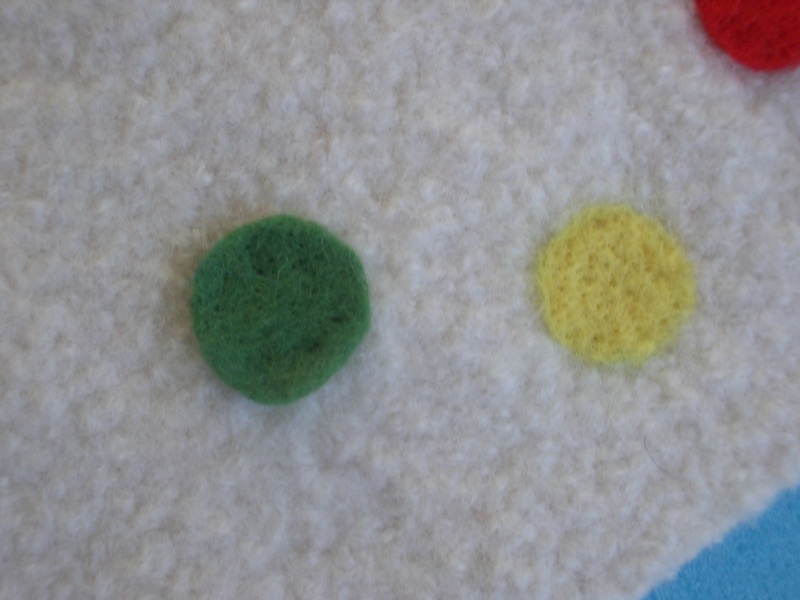 A multi-needle felting tool makes the job faster, but I was able to do each of my 1cm circles in 3-4 minutes using a single needle. Go round the edges particularly thoroughly so that they are no longer proud of the surface and the felt shape appears to be part of the main fabric. 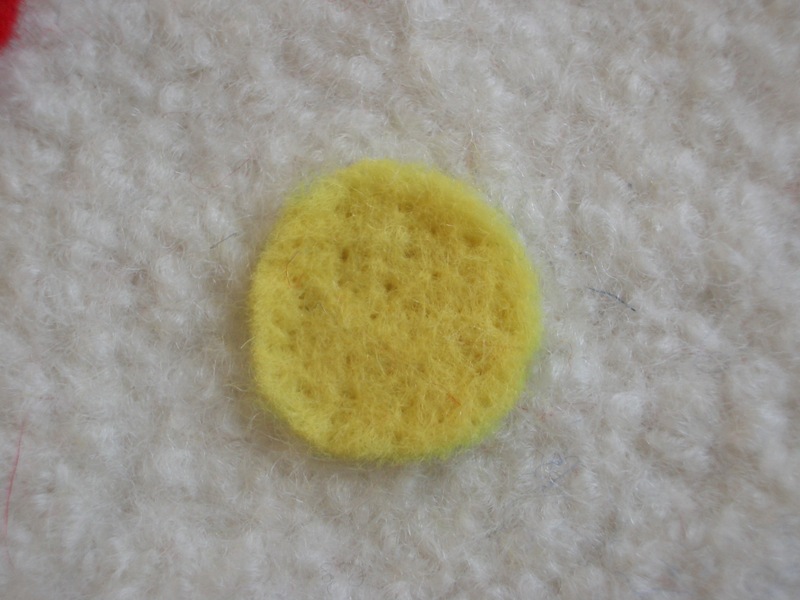 In the first photo below the yellow circle is not yet fully felted onto the backing fabric, while in the second one it has been fully attached. You can see this in the photo below too, with the yellow circle next to a green one that has only been tacked on so far. 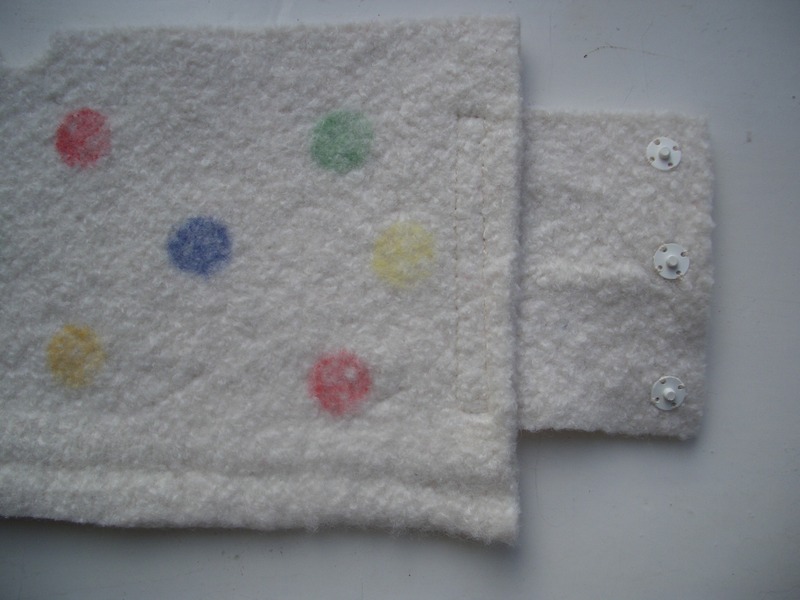 When all the circles are fully felted onto the backing fabric, give it a good press with an iron and a damp cloth to get rid of all the little stab holes. 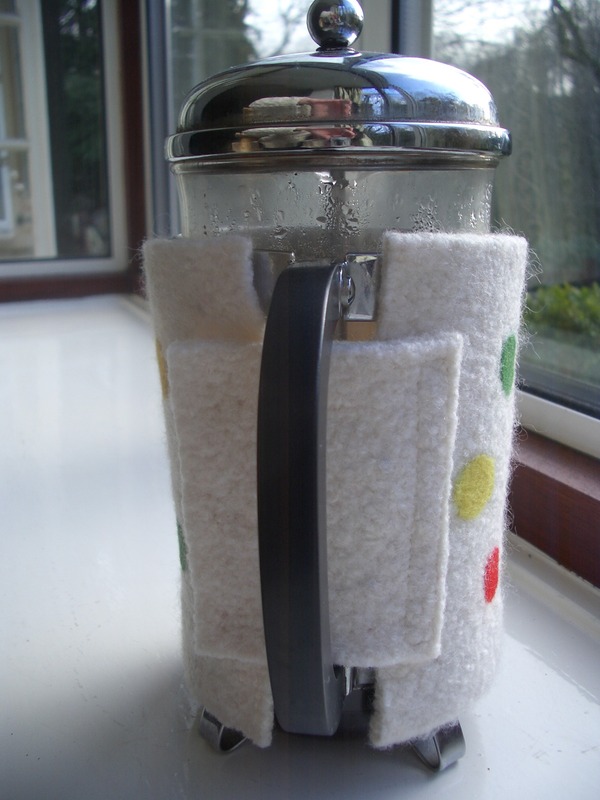 Cut a rectangle from the backing felt that will fit through the cafetiere’s handle and overlap by about 1″ on either side of the muff. The rectangle I used was 3″ wide by 3.5″ high. 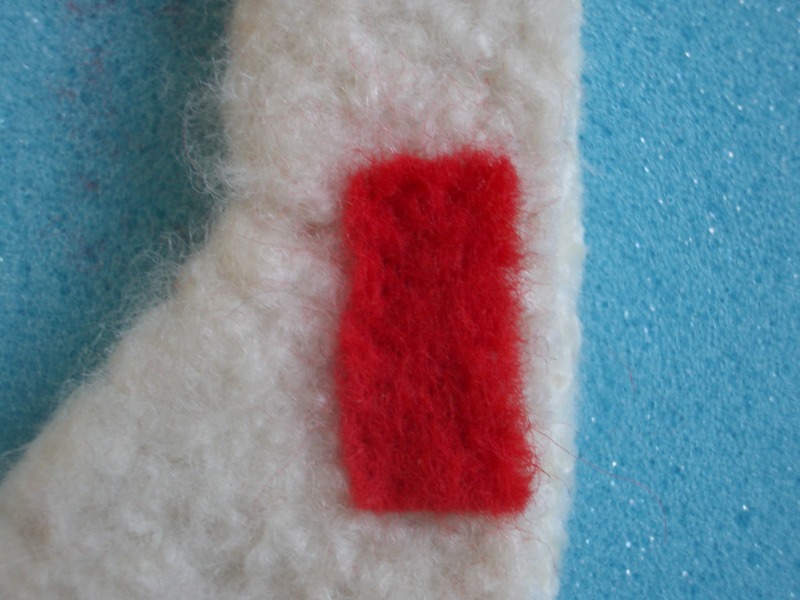 Position this rectangle in place on one side of the edge of the muff, overlapping it by 1″. Pin it and then stitch it with a double row of stitching. Fasten the muff by sewing press studs or a Velcro strip onto both the opposite side of the rectangle and the remaining edge of the muff.